"Life on the farm is kinda laid back," sang John Denver. A nice country song, but there is nothing laid back about life at Milk and Honey Farm. Our goal is bio-sustainable self-sufficiency. It requires hard work , but the rewards are many. Our physical, emotional, and spiritual health prospers. We've declared independence from the grocery store and genetically engineered foods. The money we save goes into refinements, new projects, and new learning. We are no longer dreamers, but doers -- stewards of an integrated organic homestead. Foundational values, with a careful and calculated blend of the past and present, provide us with the best of both worlds - the Frontier of the Future. 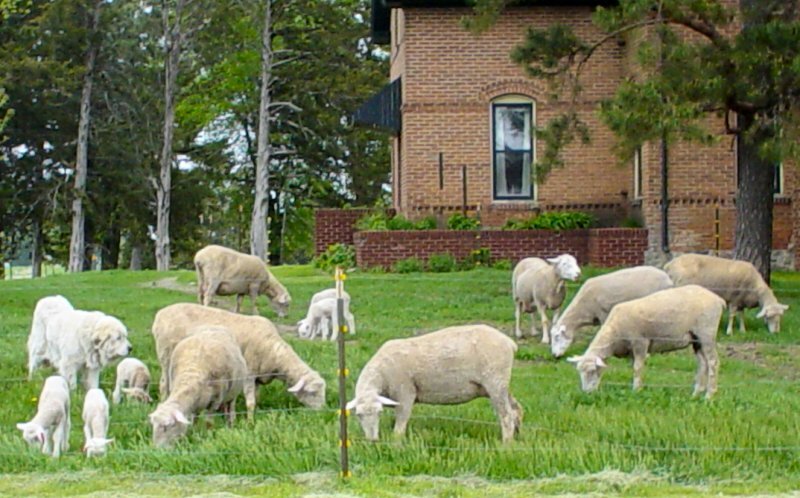 We are shepherds - care givers of a very dependent animal, yet we learn from our sheep. They provide both food for our table and warm wool comforters. Great Pyrenees guard dogs watch over our flocks and farm. 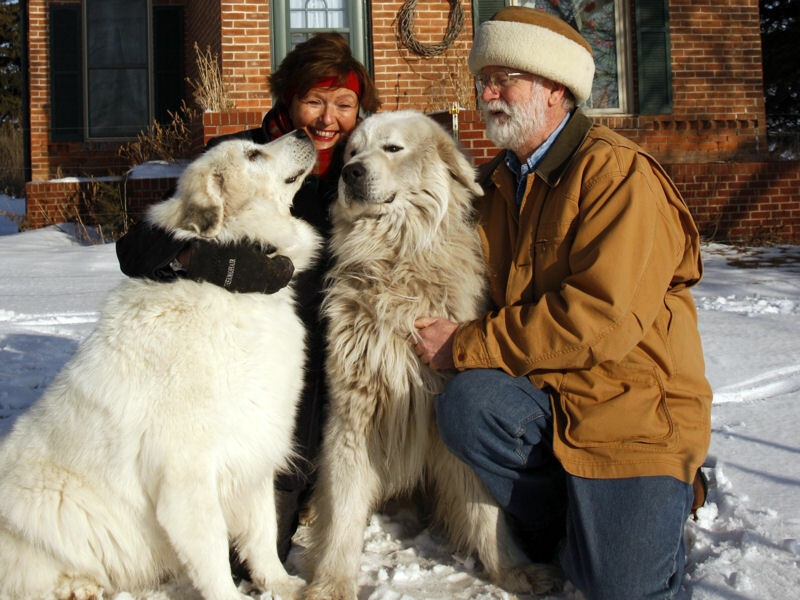 Trusted by shepherds around the world, our Great Pyrenees provide both protection and gentle companionship. We are not a kennel, but have working guard dogs and our Great Pyrenees puppies are available year round. The 10,000 square foot of organic garden combines raised beds, companion planting, mulches and compost, heirloom seed, and more, to produce the abundant harvest that feeds us. Seed saving allows us to propagate next year's organic garden while developing our own heirloom seed. Varieties of herbs and flowers are mixed in with the vegetables to create a beautiful and peaceful garden atmosphere. The vegetables feed the body, the flowers feed the soul. Years ago, we traded the asphalt and concrete of Dallas, Texas, for a rural life that makes sense. We are "country with an attitude" and it works for us! Today, we work not for a company, but for ourselves. The bottom line is health, independence - the good life. Some would say that we are a hobby farm. We live in a 121 year-old house on the home site with a barn and a little less than three acres. This would be a hobby farm if we played around at it and didn't want a return for our labor in good health and prosperity. We aren't playing around - we're serious. As Sarah says, "I worked too hard for this to be called a hobby farm." Our goal is to use every square foot to improve our health, well-being and independence. If city kids like us can do it, so can you. We didn't do it overnight! It has been a process of growing and learning as we go. Look around the Milk and Honey Farm site. You'll find creatures great and small, an organic garden, a healthy lifestyle, and perhaps a reason for a new beginning. Content Copyright © 2001-16 Milk and Honey Farm. All Rights Reserved. Web Design Copyright © 2001-16 Milk and Honey Farm. All Rights Reserved.